The EU’s top environment and industry officials are meeting Chinese leaders for talks on promoting green growth today (19 July), as Beijing advises the young, elderly and ill to remain indoors due to “heavy pollution” for the 68th time this year. Concentration of PM2.5, fine air-borne particulate matter that poses the greatest health risk, reached levels of 241 microgrammes per cubic metre near Tiananmen Square, Bloomberg cited the Beijing Municipal Environmental Monitoring Center as saying. This means that the city’s 20 million inhabitants will be exposed to pollution levels almost ten-times higher than the World Health Organisation’s recommended 25 microgrammes limit for day-long exposure. 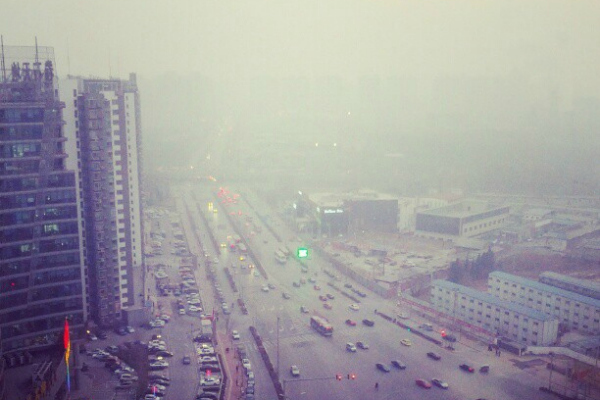 Internet-users have dubbed Beijing's smog phenomenon the 'airpocalypse'. The latest health warning came one day before Janez Poto?nik, European commissioner for environment, was due to meet Zhou Shengxian, China’s environmental protection minister, for yearly bilateral talks, focused on green growth strategy. The Chinese government has taken steps recently to try to curb public outrage at the amount of pollution in its major cities, which in Beijing reached the highest-ever recorded levels between January and February this year, according to the Beijing government website. Beijing Communist Party Secretary Guo Jinlong, the city administration’s highest ranking official, pledged this week to improve air quality, telling a meeting of municipal officials that controlling pollution was in the people’s interests and important for China’s national image. But Poto?nik is aware that Europe cannot expect China to seriously clamp down on harmful emissions unless it does the same. “We are also not only talking about talking the talk but walking the walk. I think that is the most difficult part of all. Sometimes it is easy to agree on the political initiatives [and] I don’t want to blame anyone but I always say that if you want to be internationally credible, first you have to clean in front of your own house”, he said. The Commission has begun infringement proceedings against several EU states for breaching its air quality directive. On 17 July, the British Supreme Court called on the European Court of Justice to fast-track a case brought by the environmental NGO, ClientEarth, against the UK government for failing to meet air quality standards. The case could now be heard before the end of 2013. Some 60 industry representatives are in the cortege of European officials, which includes Industry Commissioner Antonio Tajani, intent on forging new ties with Chinese companies. The European organisations include materials technology group Umicore, the European Association of Chambers of Commerce and Industry (Eurochambres), energy giant GDF Suez and Pirelli, the tyre-maker. Thirty years of rampant and often poorly regulated growth have decimated China's environment. Sixteen of the world's most polluted cities are now in China, while officials say it will take 300 years to curb an advancing desertification process. As a country with both 'developed' and 'developing' traits, China is now the world's biggest emitter of carbon. As such it is vulnerable to political pressure in the UNFCCC process it has been supporting since Kyoto. It is also highly vulnerable to climate change itself and to resource depletion – particularly freshwater, which has encouraged its shift to wind power. Unlike other forms of energy production, wind power does not depend on freshwater, and so has helped rural electrification, particularly in the north and northwest of the country. This in turn has helped slow the inexorable migration of rural workers looking for jobs in cities such as Beijing and Shanghai.